Learn how to reset the database on your iPad and iPhone app. Before you reset your database please make sure that you have synced your device by swiping down on your list of transactions or accounts. 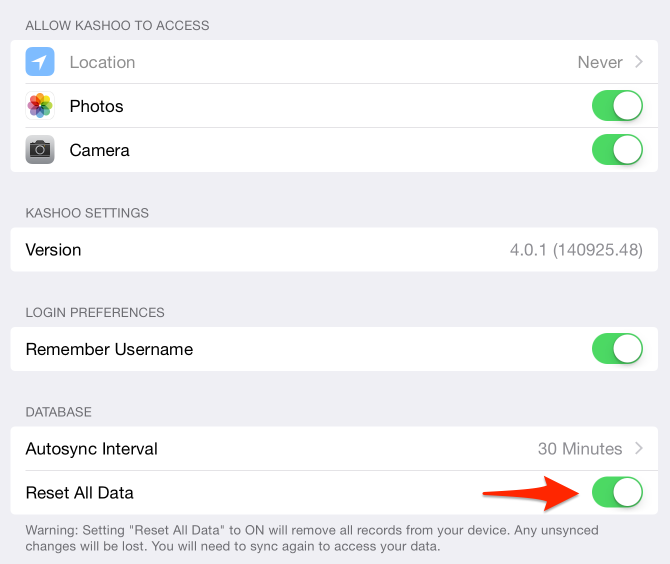 To reset your database, go to Settings on your iOS device. If you scroll down the left-hand navigation menu, you will find Kashoo. Tap on it. Turn on the Reset All Data option. The next time you open up the iPad or iPhone app, the database will be deleted and a new one downloaded.